For the sixth consecutive year, Georgia State University is first in the nation among not-for-profit colleges and universities in awarding bachelor’s degrees to African Americans, according to Diverse Issues in Higher Education. 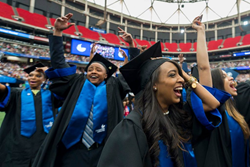 In its just-released rankings, Diverse Issues listed Georgia State first in the U.S. for graduating African-Americans with bachelor’s degrees in biological and biomedical sciences, finance and financial management services; foreign languages, literature and linguistics; history; marketing; psychology; and social sciences. Nationally recognized student success initiatives at Georgia State have eliminated achievement gaps based on race, ethnicity or income. The university has increased its bachelor’s graduation rates by 23 points, and African-American, Hispanic, Asian-American and low-income students now graduate from Georgia State at rates at or above those for the student body overall. Georgia State is also a leader in master’s degrees conferred to students from racial and ethnic minority groups, ranking fifth in business fields as well as physical sciences. Among African-Americans, the university is in the top 15 among U.S. universities in majors for master’s degrees in fields, including business, physical sciences, public health, mathematics and statistics, biological and biomedical sciences, public health, parks, recreation, leisure and fitness studies and area, ethnic, cultural, gender and group studies. The university also ranked 11th nationally in conferring doctoral degrees to African-Americans. Georgia State is working to increase opportunities for students among underrepresented backgrounds to enter graduate and professional programs. The Center for the Advancement of Students and Alumni encourages and supports students from underrepresented populations to enter advanced degree programs that can lead to academic and professional careers. More information about the rankings is available at http://diverseeducation.com/.